Safety excellence requires a strong safety culture. But what is an ideal “Total Safety Culture” and how can we best achieve one? What are the roles of Behavior-Based Safety (BBS) and Human and Organizational Performance (HOP)? We’re finding out today in a Q&A with E. Scott Geller and Steve Roberts from Safety Performance Solutions, Inc., speakers at the fast-approaching Safety Culture 2018 event! E. Scott Geller, PhD, is a Senior Partner of Safety Performance Solutions, Inc., as well as an Alumni Distinguished Professor at Virginia Tech, where he directs the Center for Applied Behavior Systems. He will be delivering the opening keynote address, Seven Life Lessons for Safety and Beyond, at Safety Culture 2018, taking place this September 12–14 in Atlanta, Georgia. Steve Roberts, PhD, is co-founder and senior partner at Safety Performance Solutions. His specific areas of expertise include the design, implementation, and evaluation of behavior and people-based safety processes, and he will be presenting an educational session, Why Workers Fail: How to Address Attitudes, Habits and Misinformation at Safety Culture 2018. Q: There is widespread recognition that safety excellence requires a strong safety culture. As leading experts in the field, how would you describe the ideal safety culture? Many factors contribute to an optimal safety culture, which we have referred to as a Total Safety Culture (TSC). 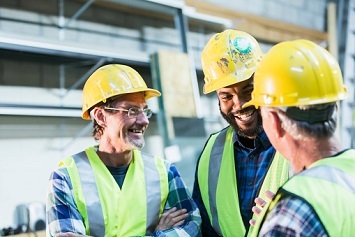 First, all personnel do not merely care about workplace safety; they actively care about the health, safety, and well-being of their fellow employees, as well as the broader community. They do not wait for an injury to occur before taking action, but instead they proactively search for hazards, at-risk behaviors, and system factors that increase the probability of an injury. They continuously make or suggest improvements to keep people safe and strengthen defenses before anyone gets hurt. In a TSC, employees at all levels of the organization have been well-educated and trained regarding safety-improvement processes; communication about critical safety issues flow freely throughout the organization; and all employees have ample opportunity for input and involvement at supporting continuous safety-improvement efforts. In addition, the physical and social work environment not only enable safe behavior, they promote and encourage safe behavior, cultivate actively-caring-for-people (AC4P), minimize human error, and implement fault-tolerant systems to mitigate or prevent negative outcomes when errors inevitably occur. Bottom line: In a TSC employees at all levels of the organizational hierarchy have become brother’s/sister’s keepers of human welfare, well-being, and life satisfaction. Q: Has the recent focus on “safety culture” replaced the popular Behavior-Based Safety (BBS) approach? Absolutely not. In fact, if applied correctly, the over-arching objective of a BBS process is to cultivate and nurture a TSC. But, over the years we have been dismayed by how many people seem to think BBS is simply a peer-to-peer coaching process for the purpose of catching people “doing something wrong” so they can be corrected. This is a narrow and distorted understanding of the original 1997 conceptualization of BBS, as well as BBS applications, and its evidence-based effectiveness at preventing injuries. In fact, a BBS process has multiple purposes. Certainly one is to identify at-risk behaviors occurring in the workplace. At-risk behaviors are not only identified and corrected with behavior-focused feedback, but the situation is analyzed (using the “ABC Analysis” familiar to most BBS users) to determine why the at-risk behavior is occurring. It’s understood that behavior is directly and indirectly influenced by its context—the physical and social work environment. When systemic determinants of at-risk behavior are identified (whether purposeful risk-taking or human error), the system must be changed in order to improve the behavior. Therefore, any observed at-risk behavior is viewed as a symptom of a potential systemic issue lying deeper within the organization. So, although feedback alone can help reduce the occurrence of at-risk behavior, feedback alone is far from sufficient at eliminating at-risk behavior. System factors must be addressed. In addition, many people seem to forget that BBS serves as a tool to promote positive or supportive feedback for safety. This behavioral support not only helps safe behavior become commonplace, it also promotes an atmosphere where proactive safety-related behaviors are routinely recognized, rather than the all-too-common practice of only reacting when something goes wrong—an injury occurs. Ultimately, the broader purpose of a BBS process is to create a TSC in which employees at all levels of the organization feel comfortable discussing safety openly among themselves–including informally delivering and receiving behavior-based feedback. Thus, when accomplished appropriately, BBS is an incredibly valuable tool to help cultivate a TSC. Bear in mind, though, BBS is not the silver bullet many have hoped it would be. It is just one part of a larger effort to craft an optimal TSC. Q: What about Human Organization Performance (HOP)—where does HOP fit in? HOP is also a set of tools aimed at improving human behavior in the workplace. In principle, HOP and BBS have much in common. Both HOP and BBS recognize the influence of the work environment on human behavior. HOP emphasizes changing the work environment to optimize human performance—including minimizing the likelihood of human error and establishing solid defenses to prevent injuries and fatalities when human error occurs. HOP tools tend to be best suited to identify and minimize unintentional at-risk behaviors (i.e., human error) rather than purposeful risk-taking behavior, which BBS directly addresses. This is why these two approaches are so complementary to each other when combined. Are there potential hazards with this job that make people nervous? Do we need new or different tools and equipment? Are there any system issues that need improvement? What other issues with this job or task need to be addressed? Are there risky behaviors commonly associated with this job? What recommendations do you have to improve this task in the future to prevent injuries and fatalities? So like BBS, HOP helps to promote the desirable TSC we described earlier. One critical difference between HOP and BBS: BBS focuses on direct observations of behavior to identify ways to cultivate a safe workplace, whereas HOP uses surveys and focus groups to ascertain system factors to address. Organizations are well-served to implement safety improvement processes that contain elements of both paradigms. Q: What are the key components of a culture-improvement process? The first step is typically an acceptance that the current culture is not supporting and promoting safety in an optimal way. Once it’s accepted that change is needed, a culture assessment is conducted to help focus improvement interventions where they are most needed. Since many diverse components contribute to a Total Safety Culture, the intervention design and implementation priorities vary dramatically across organizations. A culture assessment helps identify strengths to build upon as well as the most significant opportunities for improvement. Once the gaps between the ideal and real cultural components are identified, a path forward includes developing roles and responsibilities for personnel at all levels of the organization, defining the most critical pro-safety behaviors needed, implementing the change initiatives (which could be HOP, BBS, or countless other efforts), and employee input and involvement throughout the process. Once expectations are set, it’s critical to ensure all culture-improvement components have the support and resources required to achieve optimal performance. Finally, safety-improvement processes are integrated into the everyday business routine, organizational systems are aligned to support the desired TSC, ongoing process checks are implemented, and continuous-improvement cycles are defined and maintained. As W. Edwards Deming advised many years ago, the process is a continuous cycle of Plan, Do, Study, Act. Geller, E. S. (1985). Corporate safety belt programs. Blacksburg, VA: Virginia Polytechnic Institute and State University. (Reprinted by General Motors, Inc. and Motors Insurance Corporation, 1985). Geller, E. S. (1996). The psychology of safety: How to improve behaviors and attitudes on the job. Radnor, PA: Chilton Book Company. Geller, E. S. (2001). The psychology of safety handbook. Boca Raton, FL: CRC Press. 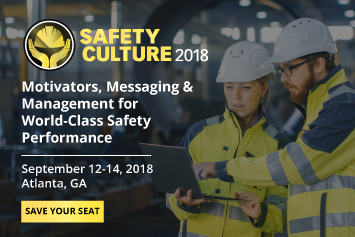 Join E.Scott Geller and Steve Roberts for their informative and engaging presentations at Safety Culture 2018, taking place September 12–14 in Atlanta, Georgia! This conference will empower employers to create an engaging and effective safety culture in the workplace that will strengthen safety compliance and engagement, reduce risk for accidents and injury, and avoid costly OSHA fines and litigation.